Today’s defence related news includes coverage of the launch of the first-ever national games for wounded, injured and sick veterans and personnel. 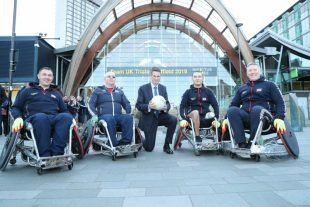 Press Association, BFBS, Forces Network and Belfast Telegraph all report that Sheffield will hold the first-ever national games for wounded, injured and sick veterans and personnel: the Team UK Invictus Games Trials 2019. The Games will include the qualifying trials for the international Invictus Games in The Hague in 2020. In parallel with the sport, there will run a series of events focused on recovery, employment, the arts and youth outreach. The Invictus Games show the incredible rehabilitative power of sport to help our wounded and injured service personnel and veterans. These new games will ensure we maintain that ‘unconquered spirit’ and momentum of recovery for the special community Invictus has created. Together with Sheffield City Council, Help for Heroes and The Royal British Legion we can help those who have life changing conditions, especially those who have sacrificed so much for our country, to lead full and rewarding lives. Image of the Secretary of State for Defence, Gavin Williamson, seen here outside of Sheffields Winter Garden today (23/01/2019), meeting members of Team UK.